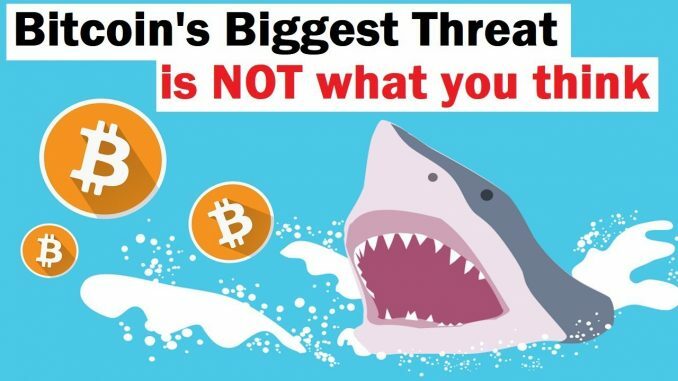 What could be the biggest danger and threat to bitcoin in the next 12 to 18 months? 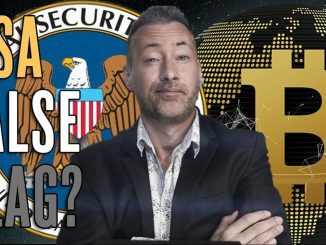 And is it really a big threat to Bitcoin – or is it a possible advantage? We explain. Thanks Alessio. Great knowledge as usual. +Alessio Rastani Now what I want to know is, we had .com bubble in 2000s, housing bubble in 2008. What kind of bubble is going to burst this time? @Alessio Rastani, Do you think the performance of Bitcoin would really depend on the country you live in during a recession? I almost look at Veneuzela as an example of what to expect because I think the next recession will bring mild versions of a fiat currency decline similar to veneuzela, and hyper inflation for the price of goods, meaning as people realize thier native currency is constantly loosing value, the more people will jump ship to maintain it with something like gold or btc. Alessio always has great content! No danger for BTC. Ressession would be a great thing. I agree with some points, but i think the poor people will sell bitcoin, and the wealthy people with liquidity will buy when blood running on the streets. So, the rich will buy btc and poor will sell. I don’t think Bitcoin’s price will be affected at same level with stock markets and economy drop. It’s not a rich or poor thing. Those who lose their jobs with no emergency funds will sell assets, but it really just depends on how many people lose jobs. It will be interesting to say the least. I remember the last recession and I don’t remember anyone I knew really struggling. Most people don’t have tons of assets anyway so do those people die? No of course not lol. Anyway if there’s a crash due to the recession then if you keep your job use it to accumulate. There are tons of rich people with jobs. My friends dad makes 8 mil a year. Anyway if you own a job and the recession hits your job then you would potentially unload some assets. The people who are truly poor probably don’t own any crypto as they are trying to survive. The middle class who has some crypto won’t sell if their job isn’t affected and even if it is they still prob won’t sell as long as they can find another job till it blows over. So I agree with some of what you are saying but i don’t think it’s a rich poor thing so much of a can you maintain your lifestyle during the recession and still earn income and invest vs do you need to sell assets and downsize. There’s plenty of rich people like doctors who if they lost their 400k income would be screwed cause they are leveraged and not many have tons of savings believe it or not. Well, depends on timing, the elites will sell before crisis coming, they will have liquidity, then crisis come and all prices/stocks/jobs/commodities will drop and since they have liquidity they will buy anything they want. Remember that fiat money inflation will not decrease that much during high peak of crisis, so the elites can stay in fiat for longer then rest of average or poor people. Those are the real winners. The point is that if you have debts and loans to pay, you gonna suffer more and sell your btc, but if you can hold then i guess is a win for you. Central banks will print fiat again during next recession. Bitcoin will be king. Deg Lado Remember crypto’s as a whole is very tiny compared to the U.S. economy. The herd is the people in the media will be saying that there is nothing to worry about and the economy will be fine. They say that because they will try to keep hysteria down. And then what they will say about how bitcoin will react cause they will have so called “experts” on. They will say don’t buy bitcoin or crypto’s cause it’s to volatile and it’s only for criminals(which is not true). 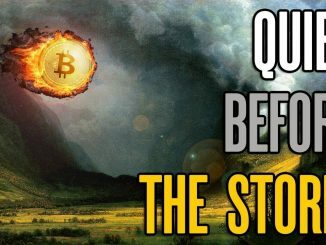 Then QE’s will happen and then everyone will be reminded why bitcoin is here. At this point hopefully you have bitcoin cause banks then most likely won’t let you buy bitcoin using their services. This is when the battle begins with bitcoin and banks. Some will jump on board with bitcoin and won’t. IYAO YAS agree with you. However I think the banks will be riding the bitcoin wave up along with alternative block chain technologies. At the end of the day, they run the show. They if there is a way to make money, they will be there and I think the next time bitcoin/gold serge’s, the banks won’t stop it as they will be fully invested. 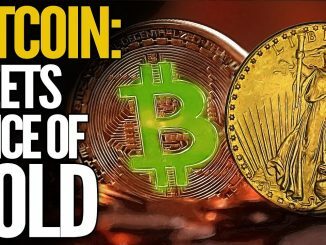 Deg Lado – Gold, silver and BTC is a must, FIAT is just a promisary note that is going to fail . We have been warned, that’s why the big institutions are secretly stashing BTC , and dare I say it, XRP will be used as a means synchronizing financial assets of all types. 1, bitcoin is not just an Asset, but also money. In 18 months should alot of merchants accept it as payment method. 2, in a world finance crisis, people don’t trust Bank like before, but bitcoin is a bank that people can trust. 3, in one finance crisis, maybe some nations can’t stand the inflation and people just want to run away from those, like Venezuela, and bitcoin is excellent for value movements. +Thành Công Bùi no it will not be that much, check the growing of lightning, in 18 months from now lightning will do all the small transactions up to 1 btc. +Thành Công Bùi ever heard of lighting network? Where have u been? Just a thought, Bitcoin being so new and is gaining traction, if people see a price increase, would you not think everyone would want to get there piece? If it is the only rising product, people could make quick cash. There might be a day when the late comers to bitcoin will buy 0.01 bitcoin for $4000 and say heck yeah I’ve have some bitcoin. I will just have to grin a little. Everyone in crypto’s right now are so early in a few years you will be considered an OG in bitcoin. Relax and don’t panic. i have similar testimony to this!…I have made so much profit from bitcoin but initially when I got into the crypto market I lost so much.Last year I bought 2 BTC that later made me massive profit during the bull run,I eventually lost most of it and sold what I had left. I decided that it would be my last time dealing with crypto until I came across Mr Benjamin Jackson a well experienced trader who taught me how to make money from crypto,he provided me with good strategies. I am spreading this for those who are lost like I was in the crypto market. Thank you for your recommendation. Most of us are HODLers but do recognize you have to make a plan to cash in at least a portion when the market goes up by five times, in just a few months! I talked to someone today who was a HODLer but took a trading course just to understand when to cash in. He highly recommended it and I agree. Next time, it is pretty much all up so traders will get REKT. in a recession people dump and sell everything in order to survive and bitcoin is no exception . i would. sell your grandma too. Central banks around the world are currently monetarising gold and silver under Basel 3.0…..BUT BTC and other crptos were not recognized by any governments as yet. Late 2020 and early 2021 would be perfect timing. As it’s smack in the middle of the halving pump. As I already said in your previous video ,the last recession gave birth to a Bitcoin,this time it will boost it’s price….